Have you had a positive experience with a travel agency? What did you like about it? Describe the service they provided for you, and thanks for sharing. 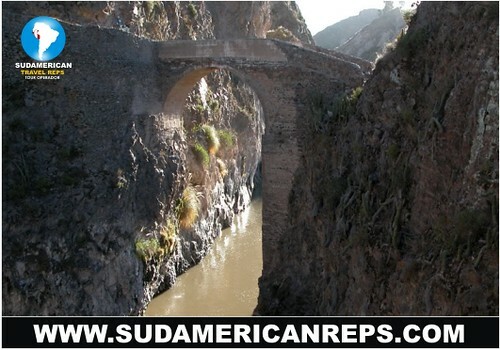 Sudamerican Travel Reps offers the usual menu of Peru tourist trips across the country, but also airline arrangements around the world. I just found out they plan on offering tours from Peru to Walt Disney World and Universal Studios in Florida, and other US destinations. You can find them at www.sudamericanreps.com. Full disclosure: I share a house with one of the folks who works with them, but I do not have a financial stake in them, and have not used their tour services. Last edited by Xibalba on Wed Jan 26, 2011 3:20 pm, edited 1 time in total. We have a small, modest, personalized travel business that also focus' on service learning/home stays etc. We are just getting started, but I think we do a great job and do it for A LOT less than other places. Basically cost plus a little extra for our efforts. I had my first experience in Peru two years ago. A french friend of mine told me about about this french travel agency (they all speak perfect english) called Evasion perou (www.evasion-perou.com). We were 4 friends doing a 18 days long trip with evasion perou for about 2000 € per person. I can definitely say it was the best time I've had. We went on a trip starting from Iquitos in the jungle, then took a flight to Huaraz for a 4 days trek in the "cordillera blanca" (just amazing), we took a flight to Nazca where we did sandboard and bugggy. From there we went to Arequipa to see the canyon and Puno to see the lake titicaca and the islands. To finish the trip we did a 4 days trail next to cusco to the macchu piccu. Service was perfect, they did all we asked for, their bilingual guides were fantastic, the hostels and restaurants were perfect. So i highly recommend this travel agency. Just get in contact with them. Your complete peru vacation planning guide, dedicated to providing our customers with great service and personalized travel planning. With our first-hand experience traveling throughout this diverse country, we will help you put together a tour that optimizes your time in Peru and allows you to see all of the best sights. As a small independent agency, we are able to spend more time focusing on the needs of our customers and building a tour that ensures complete comfort during their stay. I have been living in Peru, traveling, and working in the tourism industry here for almost 2 years. I have recently decided to venture out on my own to create an independent travel agency offering a more personalized approach. I like to think I can offer competitive prices with better service. Guest wrote: Have you had a positive experience with a travel agency? What did you like about it? Describe the service they provided for you, and thanks for sharing. Many Travel Agencies line the streets surrounding Plaza Saint Martin which is also a great place to exchange currencies. Most of the bus companies have stations in the city near ave grau and by the newer mall plaza norte bus terminal. I normally use the internet but have seen airfares clearly marked while walking around Plaza Saint Martin. Destinations to NY, Buenos Aires, Brazil, Columbia, San Francisco, Rome, Madrid, Paris, London as well. The bus terminal has buses coming and leaving all day long. If you are looking for a Taxi either Privado or Shared can usually be found on the outskirts of town near the main roads heading out of town. We take these cars to Curihuasi in the Apurimac Valley. Curihuasi has hot springs, hostels, kayaking and rafting on the Apurimac River. They have taxi's in Curihuasi and atleast 2 bus companies. A relative owns one of the nicer hostels and restaurants in the middle of town but there are several others. Bus companies line the main streets and moto taxis are most of what you will find and in large numbers I might add. As for the travel agencies the Plaza St. Martin is the main place to find fares in Lima but I normally rely on the internet for the best price and the bus schedules. Usually buy my tickets a few days in advance as seats fill up quickly. Trekperu is a professional travel agency which specializes in the Inca Trail, alternative treks salkantay, lares, huaraz and more. They also specialize in tours in Peru and Galapagos Ecuador. I am a fan because they provide excellent service. You can read some reviews on their site or on tripadisor. Qerostours Peru is another company I would recommend. The company is run by two brothers from the Qeros Community. Excellent service. LauraMH wrote: We have a small, modest, personalized travel business that also focus' on service learning/home stays etc. We are just getting started, but I think we do a great job and do it for A LOT less than other places. Basically cost plus a little extra for our efforts. We're slowly building our Travel Peru category on What's On Lima http://whatsonlima.com/listingtags/peru-tours/ I had a look at your website but couldn't determine if you're a Lima based business? If you are you can list your business on our directory for free. Last edited by E.FRIST on Tue Feb 14, 2017 12:33 pm, edited 3 times in total. I am running a travel agency in Cusco. There are so many! But maybe you find, what you need on my website? Maybe you know where I can rent a car?